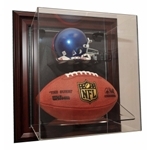 Football + 1 mini helmet acrylic case with wood frame. 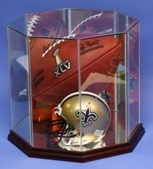 This case holds 1 regulation size NFL or NCAA football and 1 mini helmet. cases. This is a high quality investment in the protection of your memorabilia collection. Price includes 1 free nameplate. Measures 16 3/4"W X 8 3/4" D X 18 3/4"H.
clear acrylic. This is a high quality investment in the protection of your memorabilia collection. design is a nice change from traditional squared edges display cases. that allows it to conform to the round shape of the display case. you can see the entire helmet. Includes 2 free nameplates. Additional nameplates are available. Interior Dimensions 15" x 5-1/4" x 5-3/4"
see the entire helmet. Includes 1 free nampelate. Additional nameplates are available. Interior Dimensions 7 3/4" x 5 1/4" x 5 3/4"
so you can see the entire helmet. Includes 3 free nameplates. Additional nameplates are available. Interior Dimensions 21" x 5-1/4" x 5-3/4"
so you can see the entire helmet. Featuring a cherry wood base. 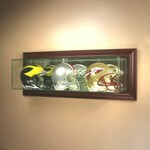 display your autographed or memorable football or baseball Riddell mini 3 5/8" scale PVC helmets. and lockable door latches. Cabinet comes ready to be mounted to your wall. Choose from 4 wood finishes. Comes with up to 8 free nameplates. Price includes up to 8 free nameplates. Additional nameplates are available. If you don't want nameplates, please leave the fields blank. Comes with up to 16 free nameplates. Price includes up to 16 free nameplates. Additional nameplates are available. If you don't want nameplates, please leave the fields blank. 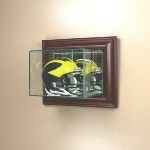 Wall mountable mini football helmet acrylic case with wood frame. protection of your memorabilia Price includes 1 free nameplate. oak or walnut wood base and real UV protected glass. Includes 1 free nameplate. 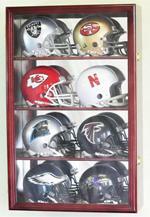 Desktop mini football helmet glass display case with laser etched text. Features choice of furniture grade solid wood bases and full mirrored back. The info that you type in the engraving fields will be laser etched directly onto the case. The location of the etching will be centered at the bottom of the front panel. unique hinged design allows for easy access. Mounting hardware is included. allows for easy access. Mounting hardware is included. 21 x 6-1/4 x 5-3/4. Our unique hinged design allows for easy access. Mounting hardware is included. 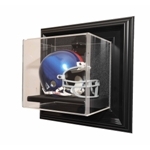 Wall mount single Mini Helmet glass display case featuring a furniture grade wood frame, mirrored back and real UV protected glass. Our unique hinged design allows for easy access. Mounting hardware is included. Wall mount double Mini Helmet glass display case holds 2 mini football helmets, baseball batting helmets, or hockey goalie masks. Featuring a choice of furniture grade wood frame, mirrored back and real UV protected glass. Interior Dimensions 15 x 6 1/4 x 5 3/4. Our unique hinged design allows for easy access. Mounting hardware is included. The text that you type into the engraving fields will be laser etched directly onto the glass. The location of the etching will be centered under each helmet on the lower part of the front panel. If you would like the etching to be in a different location, or if you would like additional panels etched or a traditional engraved nameplate - plaque, please call or email us. Wall mount triple Mini Helmet glass display case holds 3 mini football helmets, baseball batting helmets, or hockey goalie masks. Featuring a mirrored back, furniture grade wood frame and real UV protected glass. Interior Dimensions 21 x 6-1/4 x 5-3/4. Our unique hinged design allows for easy access. Mounting hardware is included. is also mirrored so you can see the entire ball. Inside dimensions: 12 x 12 x 11.